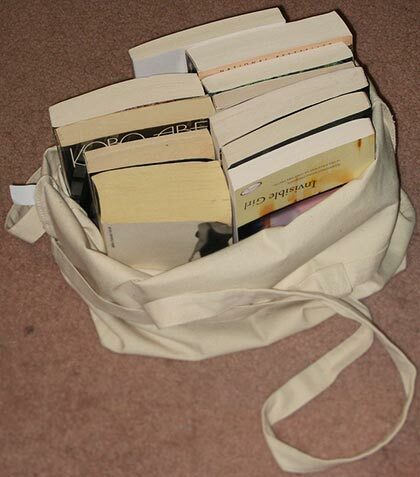 I grabbed one of my larger book totes today as I headed out hoping that I’d have lots of books to fill it up with. You see, I went to a book sale! One of the suburbs nearby was having a book sale with the purpose of raising money for a scholarship fund and my small contribution of $11 got me this bag full. What a haul! I enjoyed The Widow’s War, and Seven Gothic Tales is an old favorite. Have fun! What a great deal! And for a good cause. 🙂 I have Stolen Child in my TBR collection and am looking forward to reading that one. Wow, lucky you! I’ve read the Dinesen and the Robinson and enjoyed them both. 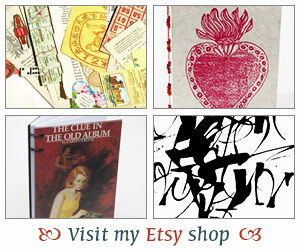 How lucky you were to get such great finds here! The Penny Vincenczi series is great fun to read. I like Housekeeping and Little Children as well. Talk about bargains… mamma mia! That’s a great collection… enjoy “The Ruined Map.” I think that’s Abe at his best. While he might be hesitant to admit to it, Murakami owes a great deal to Abe… (believe me, I had the opportunity to go one-on-one in 1998 with Murakami and asked him point blank… I got, of course, no answer). I just love book sales! I picked up The Stolen Child with a gift card I got over Christmas – I’m thinking that it just might be a perfect read for Carl’s Once Upon a Time Challenge this spring! What a great haul! I thought that book was a Penny Vincenzi–that’s the same edition I have. I’ve read a book by Pip Granger, too, though not this one. I’d like to read more. Enjoy your new books! I’ve been curious about Little Children. Let us know what you think! Ruined Map – love the name. Sounds interesting. I’m interested in what you think of Housekeeping. I had a professor in college who adored that book to the point of obsession. I admit I didn’t see it, but perhasp I was too young. You always come across the best finds. You know what a fan I am of Isak Dinesen and I think you will really enjoy Seven Gothic Tales. I have not heard of some of the other ones you picked up and after reading the descriptions I believe some of them will end up on my reading list! Andi – When I saw The Stolen Child I quickly snatched it up! I really enjoyed your review of it on Estella’s Revenge. I have a feeling I’m going to love it. Gentle Reader – I’ve not read any Dinesen so I’m excited to add one of her books to my library! Literary Feline – I know, I felt like I should have bought more to contribute to the cost! Chrisbookarama – Aren’t they the best! Ravenous Reader – I’ve not read any Vincenczi even though her books look like fun reads. They are kind of tomes aren’t they? JCR – No way, you met Murakami?! How very cool. Ok, now I’m super interested to read this book. I haven’t read any Abe. Stephanie – Oh that’s right! I may have to save this one for Carl’s challenge. I’m so looking forward to it. Dark Orpheus – Ha,ha… So true right! Danielle – I remember you posting about a couple of the Vincenzi books so I picked this one up and thought of you. Did you like the Granger book? It sounds like a bit different than the typical mystery. Tiffany – I wanted to see the movie when it came out but missed it so now that I have the book I’ll try to read it before seeing the movie. Isabel – I know, isn’t it good? Have you read any Abe? Lauren – The gothic book is one I’ve had on my list for a long time! I am curious about the Housekeeping book because I believe the author won a literary prize with another of her novels. Should be interesting! What a lovely bag of books. You did indeed get some good ones! Nice haul! I have the same edition of the Vincenzi, and *loved* The Sisters. There was a book sale here last Spring and I’m already keeping my eye out for it! Stefanie – Don’t the book bags look great when filled! Oh, what fun!! I love booksales – and it was for a great cause. You got your hands on some great sounding read. I really loved Widow’s War. I didn’t think I would, but it was one that was sent to me to review and I ended up loving it. I will be anxious to hear your thoughts on it and on the others as well!! Happy reading! April – Good to hear that about Widow’s War. I didn’t even get a chance to really read what it was about until I had bought it and I wasn’t so sure. I’ll keep you posted! I want to read The Stolen Child too. Looks like you found alot of nice titles, grats! Kat – I’ve read several reviews of it and it sounds great – can’t wait! Book sales for non-profits are the best kind! The Mitford book is great. There’s a new one out about the Mitford sisters, I have been curious how it compares. It does sound like you got some great ones. yay for book sales! Alisia – I agree, it makes you feel like not only are you getting a deal but it’s also going to a worthy cause. Nymeth – Yay for book sales indeed!